Chenonceau Castle is one of the most well known chateaus in the Loire Valley. Perched above the river Cher, the castle was originally built in 1513. With its fine French architecture and reflection on the water, has been a favorite subject of art for centuries. They’re the things postcards were made for. In this tapestry, the glowing afternoon light in the scene is captured perfectly. The sunlight from the left illuminates the castle, the reflection in the water, and the tree in the foreground in a way that is exceptionally stunning. The blues and violets however gives a sense of the coolness of the day starting to set in. 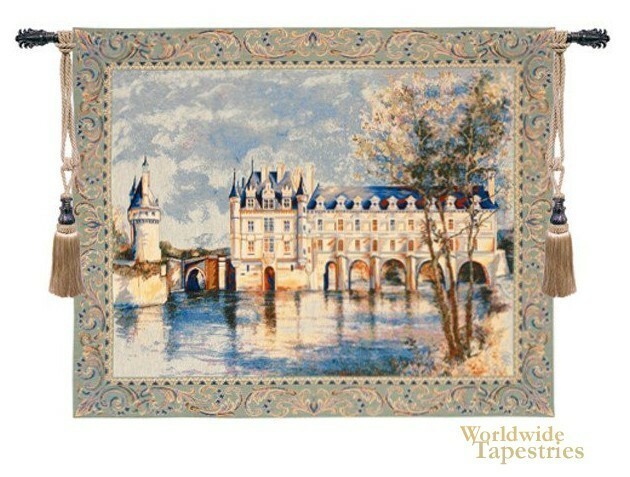 “Chenonceau Castle” is finely crafted and beautiful in effect. This tapestry is lined and has a tunnel for easy hanging. Note: tapestry rod and tassels, where pictured, are purchased separately. Dimensions: W 22" x H 17"
Dimensions: W 33" x H 27"
Dimensions: W 44" x H 37"